More Details Under Armour Vanish Full-Zip Active Jacket Details Under Armour "Vanish" jacket in silky performance fabric. Sweat wicking, quick drying, & 4-way stretch. Shaped hem for enhanced coverage. Stand collar; zip front. Long raglan sleeves; thumb loops. Side zip pockets. Formfitting. Polyester/elasterell p. Imported. 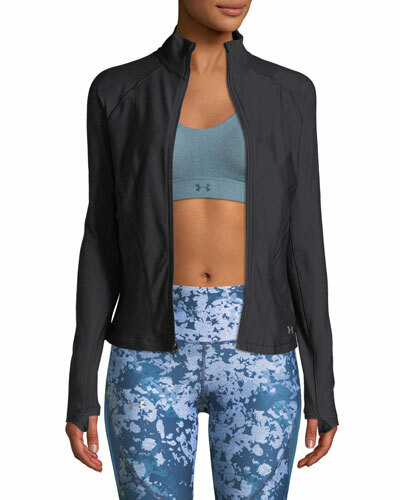 Under Armour Vanish Full-Zip Active Jacket Details Under Armour "Vanish" jacket in silky performance fabric. Sweat wicking, quick drying, & 4-way stretch. Shaped hem for enhanced coverage. Stand collar; zip front. Long raglan sleeves; thumb loops. Side zip pockets. Formfitting. Polyester/elasterell p. Imported. More Details Peter Millar Hartford Zip-Front Jacket Details Peter Millar "Hartford" jacket in technical fabric. 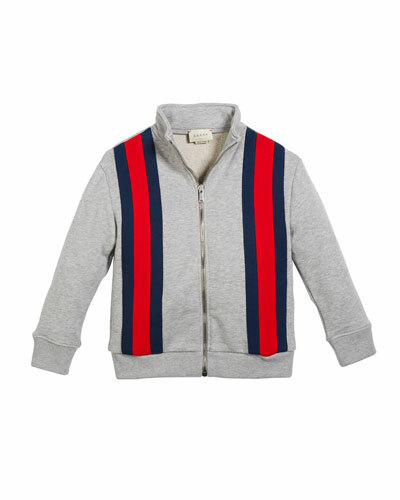 Stand collar; full-zip front. Adjustable snap cuffs. Side slip pockets. Side adjusters at waist. Hip length. Polyester. Imported. Peter Millar Hartford Zip-Front Jacket Details Peter Millar "Hartford" jacket in technical fabric. 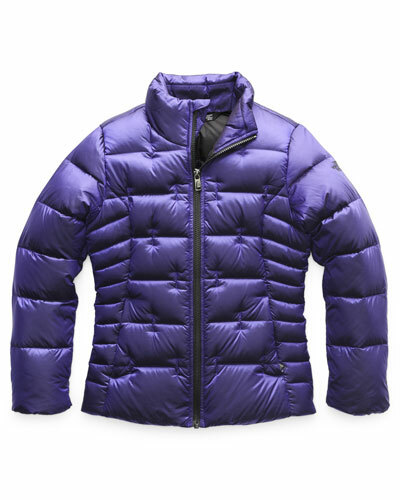 Stand collar; full-zip front. Adjustable snap cuffs. Side slip pockets. Side adjusters at waist. Hip length. Polyester. Imported. More Details Blanc Noir Quilted Leather & Mesh Moto Jacket Details Blanc Noir moto jacket in quilted leather and power mesh panels with lace-up details at back. Stand collar; full-zip front. Long sleeves; zip cuffs. Front zip pockets. Arched hem. Cropped fit. 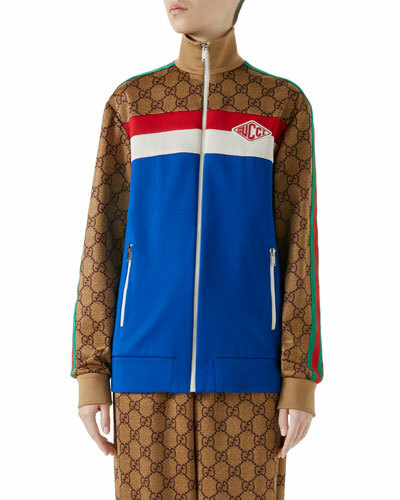 Power mesh, polyester. Imported. Blanc Noir Quilted Leather & Mesh Moto Jacket Details Blanc Noir moto jacket in quilted leather and power mesh panels with lace-up details at back. 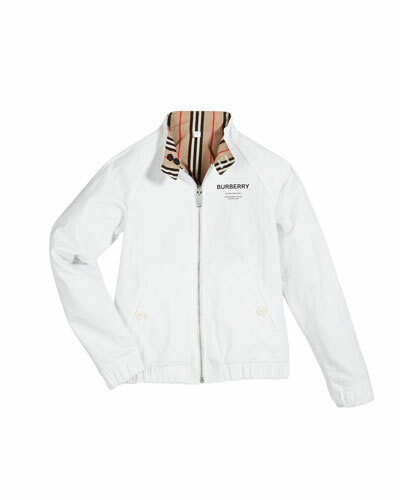 Stand collar; full-zip front. Long sleeves; zip cuffs. Front zip pockets. Arched hem. Cropped fit. Power mesh, polyester. Imported. 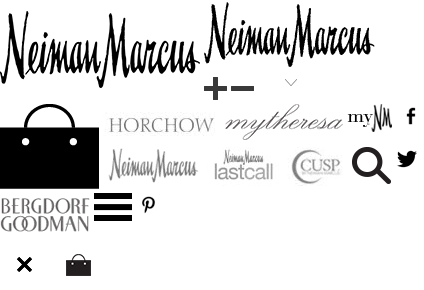 More Details Blanc Noir Quilted Leather & Mesh Moto Jacket Details EXCLUSIVELY AT NEIMAN MARCUS Blanc Noir moto jacket in quilted leather and power mesh panels with lace-up details at back. Stand collar; full-zip front. Long sleeves; zip cuffs. Front zip pockets. Arched hem. Cropped fit. Power mesh, polyester. Imported. 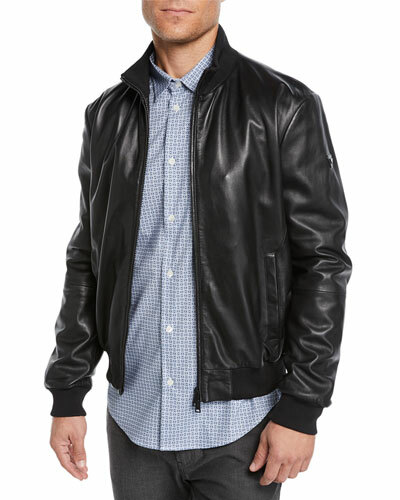 Blanc Noir Quilted Leather & Mesh Moto Jacket Details EXCLUSIVELY AT NEIMAN MARCUS Blanc Noir moto jacket in quilted leather and power mesh panels with lace-up details at back. 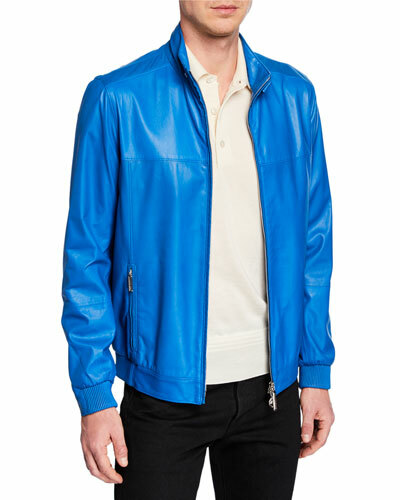 Stand collar; full-zip front. Long sleeves; zip cuffs. Front zip pockets. Arched hem. Cropped fit. Power mesh, polyester. Imported. 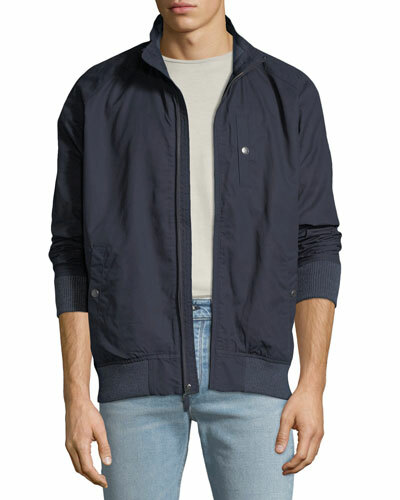 More Details Faherty Men's Newport Lined Zip-Front Jacket Details Faherty "Newport" jacket with full lining. Stand collar; zip front. Snap pocket at left chest. Side snap pockets. Straight hem. Cotton. Imported. 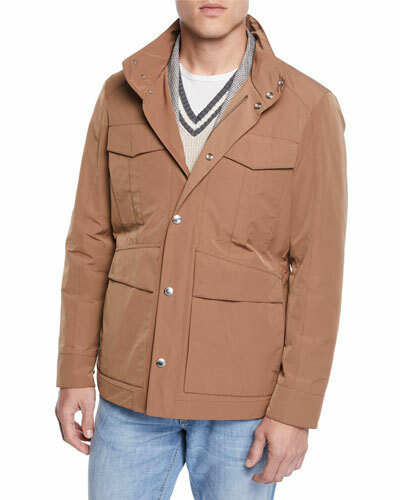 Faherty Men's Newport Lined Zip-Front Jacket Details Faherty "Newport" jacket with full lining. Stand collar; zip front. Snap pocket at left chest. Side snap pockets. Straight hem. Cotton. Imported. 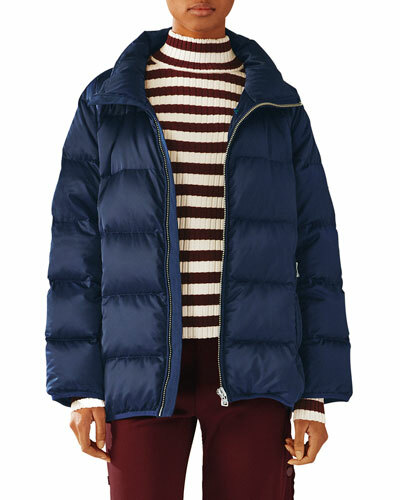 More Details Moncler Men's Maya Shiny Down Puffer Jacket with Hood Details Moncler "Maya" puffer jacket with 90/10 down/feather fill. 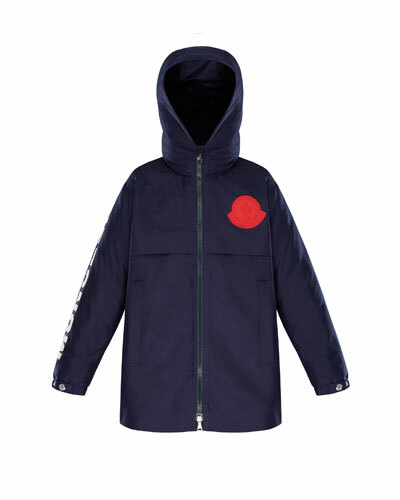 Removable hood with snap-closure. 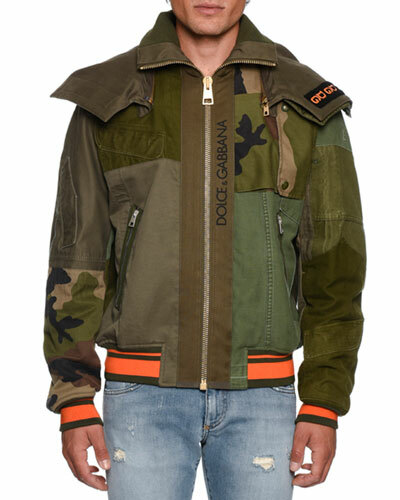 Stand collar; full-zip front. Long sleeves; zip pocket on left. Side zip pockets. Nylon. Imported. 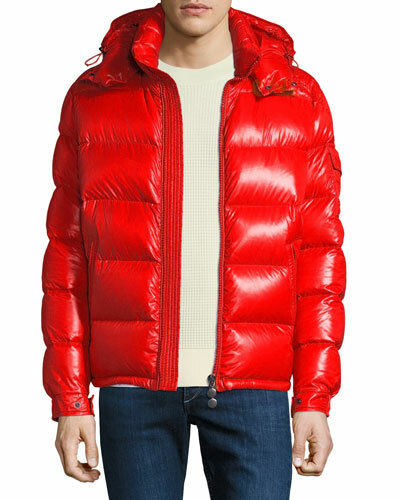 Moncler Men's Maya Shiny Down Puffer Jacket with Hood Details Moncler "Maya" puffer jacket with 90/10 down/feather fill. 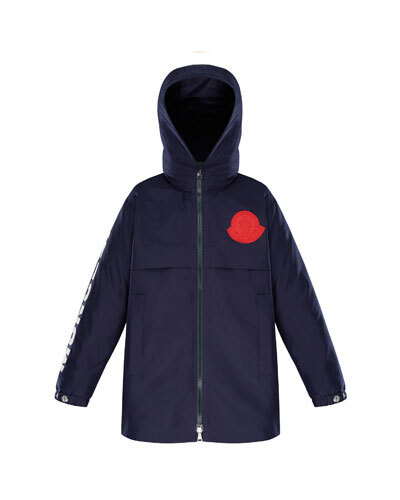 Removable hood with snap-closure. 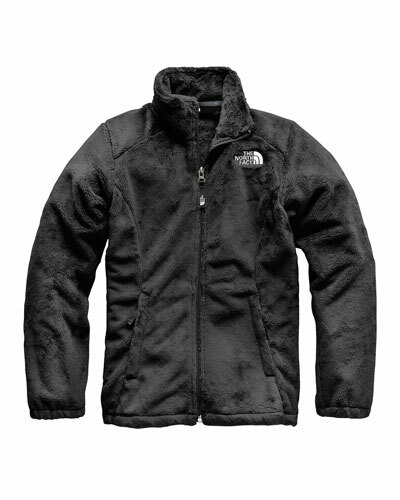 Stand collar; full-zip front. 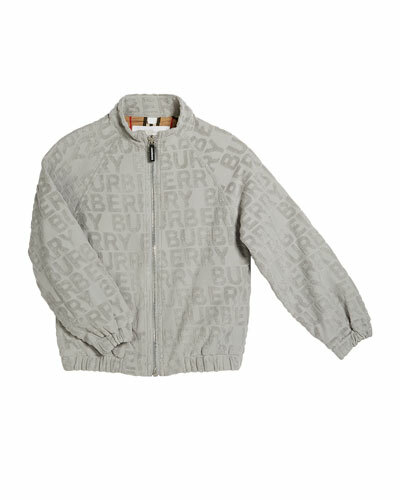 Long sleeves; zip pocket on left. Side zip pockets. Nylon. Imported. 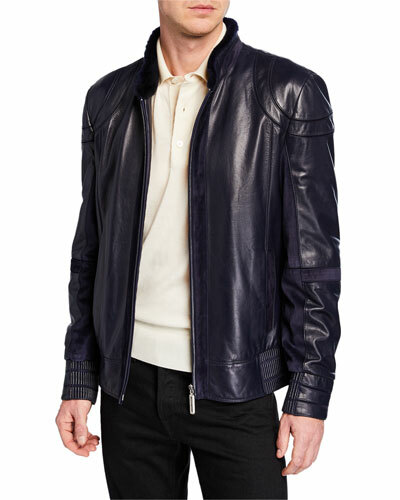 More Details Emporio Armani Men's Napa Leather Bomber Jacket Details Emporio Armani napa sheep leather bomber jacket. 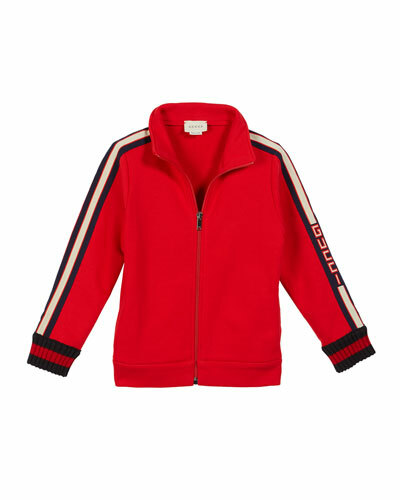 Stand collar; full-zip front. Side slip pockets. Long sleeves. Ribbed hem and cuffs. Lamb leather/polyester/spandex. Imported. 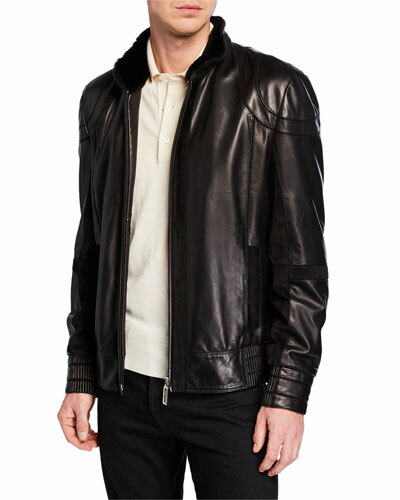 Emporio Armani Men's Napa Leather Bomber Jacket Details Emporio Armani napa sheep leather bomber jacket. 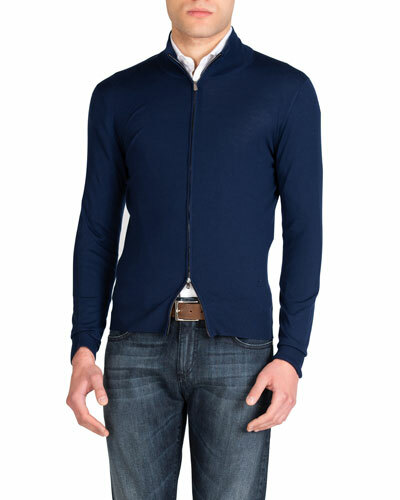 Stand collar; full-zip front. Side slip pockets. Long sleeves. Ribbed hem and cuffs. Lamb leather/polyester/spandex. Imported.